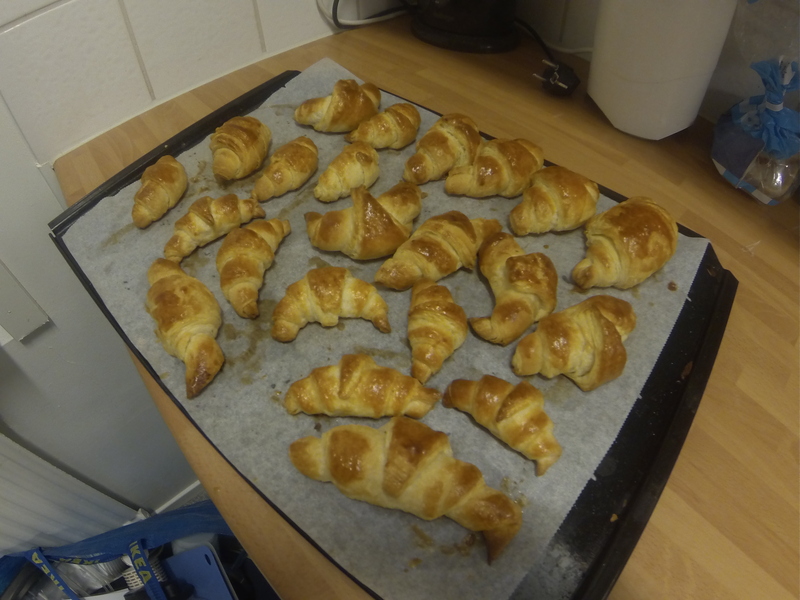 A freshly baked batch of croissants. Croissants have been part of my French Cuisine repertoire for a few years now, but my greatest challenge has been to get the layers to separate just right. The key to perfectly crispy croissants is good quality butter, plenty of rest and creating 32 layers of dough. The layers in a croissant are created by first folding the dough over a layer of butter, rolling it out and then repeatedly folding it over itself. First you have 2 layers, then 4, then 8 and so on. Finally, you allow the dough to rest in intervals, which separates the layers. The baked croissants will then have that classic lightness and crisp, crumbly surface. Of course, it takes time to perfect the technique. The pictures in this post are from my latest attempt. I will keep practicing and post the progress whenever I can. The Kitchen Ninja's Dojo Cooking lessons for everyone. Cook like a ninja!